Whether it’s watching the Big Game with the boys or sitting sticky fingered watching your family enjoy the Meaty Eats Marinated Chicken Wings, you will be sure you made the right choice. We start with the finest roaster chicken wings – no puny wings here! Thick and meaty you’ll know that these wings are the highest quality chicken because you can taste the difference in product that was raised without the use of antibiotics and hormones. We then artfully blend herbs and spices to enhance the natural goodness of the chicken wings. 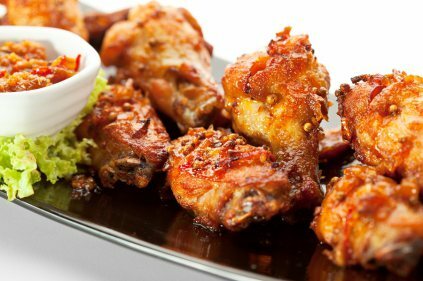 You can feel confident that you’ll be a star in the kitchen, because you are serving your family the most flavorful and nutritious chicken wings available. Be a master in your own kitchen or feel free to use some of our unique recipes. Please follow the recipe link.